Migrate Exchange Server mailbox to Lotus Notes supported NSF format and access EDB database in Lotus Notes without any data loss or data alteration. Additionally, recover and export corrupted EDB file data to NSF format. We understand importance of time and thus designed our Exchange mailbox to Lotus Notes database Converter for multiple file migration in one go. You can migrate EDB files to Lotus Notes file in bulk which in turn saves your time. The software retains email properties like To, CC, Subject, Date etc and ensures that attachments data remain safe. The tool allows you to perform conversion process without having to worry about misplace of attributes. To work with this efficient EDB mails reader, you do not require installation of Microsoft Exchange Server in your computer. The utility can export offline/dismounted Exchange database to NSF format. To maintain flawless conversion process, the software first check out if the email is healthy or corrupt and recovers them if in case they are. It repairs minor as well as major level of corruption in Exchange mailboxes. EDB to NSF Reader extracts emails from both public as well as private folders and then convert them to Lotus Notes NSF file within few clicks. The software has do-it-yourself like interface that assists users with less tech know-how to bring into process of conversion. The tool is designed in such a manner that even non-technical person can run the software. This software support Microsoft Windows 2000, 2003, 2008, XP, Vista, or Windows 7 (32-bit or 64-bit) and all versions of Exchange Server includes Exchange 2013, 2010, 2007 (& below versions), and Lotus Notes 9.0, 8.5, 8.0, 7,0, 6.5 and 6.0. The Exchange EDB to Lotus Notes NSF conversion solution provides a separate functionality for contacts extraction. It creates a separate file, names.nsf, for extracting mailbox contacts from EDB file into NSF format. Using this application you can read unlimited Exchange EDB file database and access emails, tasks, notes, attachments, contacts, journals and etc. If you want to know how to read EDB database to NSF, then just download free trial version and judge software efficiency. Through this free demonstration you can get full knowledge about software unique features. 24X7 online support available. Our organization decided to migrate from Exchange Server to Lotus Notes application, but the major challenge was to export mailboxes from Exchange into Notes supported format. We tried many tools, but majority of them led to data loss or corruption. Luckily, one of our employees got to know about this software, which easily extracted selective mailboxes into NSF format. Moreover, public EDB database also got exported without any authentication issue. 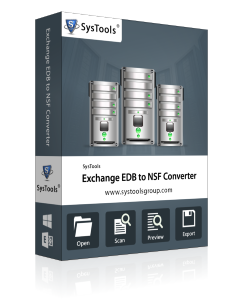 I must say that EDB to NSF Reader is the best conversion solution for converting Exchange EDB files into NSF format. I could easily extract and convert highly corrupted EDB files within few seconds. Moreover, the integrity of data was also maintained during the conversion process. Thanks to the team for such an amazing utility. The tool did a great job for me. We had a tremendous amount of Exchange data, the software converted a huge mailbox in NSF file format within few clicks. It made conversion process a piece of cake. Thanks Team!